Bit of a glossier week than usual, what’ve you been wearing? Some exciting (for me at least!) lipstick news coming up next week, keep your eyes peeled! 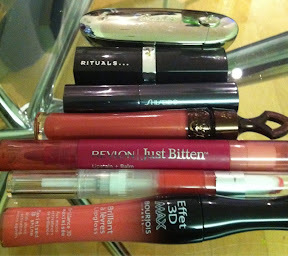 A lovely selection of lipsticks, I don't think I could pick a favourite out of those as they all look very inviting. 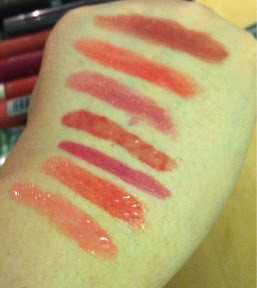 This week I've been wearing Bonheur quite a lot. Yesterday I did something unusually for me and and just wore a clear gloss. It was one of those tingly plumping ones and the sensation was quite addictive! 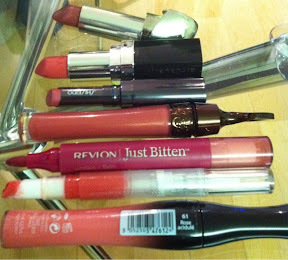 I have been mainly wearing Revlon super lustrous gloss in Pink Pop. It looks shocking worn at the same time as green eye liner, but what the heck! Currently obsessed with my Clinique chubby stick in Richer raisin. Excellent daytime wear. Frilly Knickers (what a great name!) I have to say that I've been pleasantly surprised by the Revlon lipstains, they're not blue-toned, and stay true to the shade as they wear off, which is great.